Astronomers using the National Science Foundation's 12 Meter Telescope at Kitt Peak, AZ, have discovered the complex organic molecule vinyl alcohol in an interstellar cloud of dust and gas near the center of the Milky Way Galaxy. The discovery of this long-sought compound could reveal tantalizing clues to the mysterious origin of complex organic molecules in space. "The discovery of vinyl alcohol is significant," said Barry Turner, a scientist at the National Radio Astronomy Observatory (NRAO) in Charlottesville, Va., "because it gives us an important tool for understanding the formation of complex organic compounds in interstellar space. It may also help us better understand how life might arise elsewhere in the Cosmos." 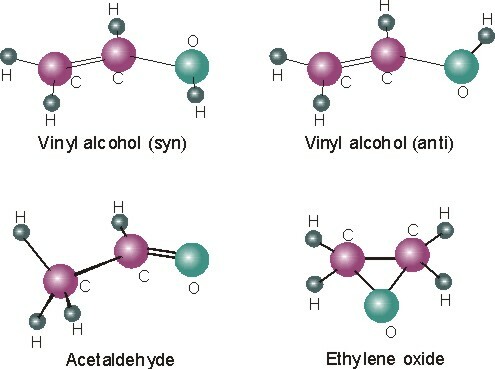 Vinyl alcohol is an important intermediary in many organic chemistry reactions on Earth, and the last of the three stable members of the C2H4O group of isomers (molecules with the same atoms, but in different arrangements) to be discovered in interstellar space. Turner and his colleague A. J. Apponi of the University of Arizona's Steward Observatory in Tucson detected the vinyl alcohol in Sagittarius B -- a massive molecular cloud located some 26,000 light-years from Earth near the center of our Galaxy. The astronomers were able to detect the specific radio signature of vinyl alcohol during the observational period of May and June of 2001. Their results have been accepted for publication in the Astrophysical Journal Letters. Of the approximately 125 molecules detected in interstellar space, scientists believe that most are formed by gas-phase chemistry, in which smaller molecules (and occasionally atoms) manage to "lock horns" when they collide in space. This process, though efficient at creating simple molecules, cannot explain how vinyl alcohol and other complex chemicals are formed in detectable amounts. For many years now, scientists have been searching for the right mechanism to explain how the building blocks for vinyl alcohol and other chemicals are able to form the necessary chemical bonds to make larger molecules - those containing as many as six or more atoms. "It has been an ongoing quest to understand exactly how these more complex molecules form and become distributed throughout the interstellar medium," said Turner. Since the 1970s, scientists have speculated that molecules could form on the microscopic dust grains in interstellar clouds. These dust grains are thought to trap the fast-moving molecules. The surface of these grains would then act as a catalyst, similar to a car's catalytic converter, and enable the chemical reactions that form vinyl alcohol and the other complex molecules. The problem with this theory, however, is that the newly formed molecules would remain trapped on the dust grains at the low temperature characteristic of most of interstellar space, and the energy necessary to "knock them off" would also be strong enough to break the chemical bonds that formed them. "This last process has not been well understood," explained Turner. "The current theory explains well how molecules like vinyl alcohol could form, but it doesn't address how these new molecules are liberated from the grains where they are born." To better understand how this might be accomplished, the scientists considered the volatile and highly energetic region of space where these molecules were detected. Turner and others speculate that since this cloud lies near an area of young, energetic star formation, the energy from these stars could evaporate the icy surface layers of the grains. This would liberate the molecules from their chilly nurseries, depositing them into interstellar space where they can be detected by sensitive radio antennas on Earth. Astronomers are able to detect the faint radio signals that these molecules emit as they jump between quantum energy states in the act of rotating or vibrating. Turner cautions, however, that even though this discovery has shed new light on how certain highly complex species form in space, the final answer is still not in hand. "Although vinyl alcohol and its isomeric partners may well have formed on grains," said Turner "another important possibility has been found. The grain evaporative processes near star formation appear to release copious amounts of somewhat simpler molecules such as formaldehyde (H2CO) and methanol (CH3OH), which may be reacting in the gas phase to produce detectable amounts of vinyl alcohol and its isomers." A program to search for other families of isomers is planned, which the astronomers believe could distinguish between these two possibilities. The astronomers used 2- and 3-mm band radio frequencies to make their observations with the 12 Meter Telescope. This telescope was taken off-line by the NRAO to make way for the Atacama Large Millimeter Array, and is now operated by the Steward Observatory of the University of Arizona. Built in 1967, the telescope has had a long and productive history in detecting molecules in space.